This is your guide to the many types of retirement communities on Long Island for over age 55 to meet every need. There are apartments on Long Island for seniors, affordable 55+ housing, condos, co-ops, single homes, manufactured homes, master-planned communities and more. Many residents quit snow shoveling and lawn mowing and sell their long-time home to find an over 55 community on Long Island. They can use their equity to buy a new home and still have some money left over for retirement savings. This scenario has gone on for a long time and isn't likely to change. Some retirees move to warmer states but also consider Long Island. Long Island has outstanding amenities for retirees in its great 55+ communities, parks, water recreation, libraries, natural surroundings, and train service to the city. Town homes and villas for 55+ with garages by Beechwood Homes - Priced starting in upper $400's - Low taxes (verify) - Part of the master community The Boulevard which is a mixed-use development. 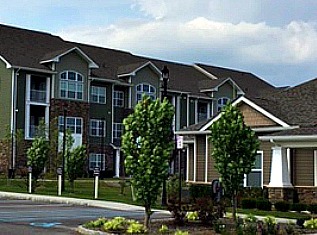 The Reserve at The Boulevard apartments showing clubhouse and apartments. The mixed use development will have a grocery within walking distance, bagel shop, dry cleaners and more (verify). Ask your Country Pointe Meadows rep about amenities and plans. concierge and more (please verify all amenities). By Northwind Group - Starting price is $400's. 148 town homes. Gas fireplaces. Craftsman style. Clubhouse, 2 pools, putting green, fitness, bocce ball, and more (verify). Phase 3 now. CONTACT: Sales Office: 1000 Sunrise Highway, Blue Point - 631-281-3300 - Models open Saturday and Sunday 10-5. Appointments recommended. South Shore, Suffolk - a medium-sized community of 280 units - a building consists of 8-9 homes in a row - some units for moderate income - designed to protect environmental concerns - Price from high-$300's-mid-$400's. Nearing sell-out. Vineyards at Blue Point moderate income units - 28 affordable homes. Available town homes are priced at $327,000 (income and asset limits apply). The units priced at $218,000 are sold out. Also see Retirement Communities in The Hamptons, South Fork of Long Island (including Moriches), go here. Luxury clubhouse with heated pool and concierge. Resort amenities include tennis, bocce, wine cellar, walking trails and more. Near beaches and vineyards. 2 and 3-bedroom duplex condos starting upper $600's with upstairs 2nd bedrooms. Some with dens. Partly senior apartments, luxury and some affordable senior apartments and purchase condos. By Greenview. Homes from high $300's. 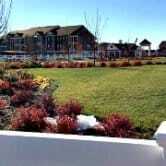 New: Westbrook Green at East Islip, senior rental apartments (LI) (631-339-1492). Read our Review of Westbrook Village. By The Engel Burman Group - Old Oak Tree Dairy property. Minutes from Huntington and Northport Villages. Phase 1 sold out. Now on Phase II with pre-construction pricing in $700's. Melville - New resort-like community with affordable pricing - photo with permission shows rendering of clubhouse - Gated on 13 acres - 261 attached 2-bedroom condos - Limited number of units available priced in $300's based on qualifying (verify all information). Looking at income, assets and residency. Open market units from upper $300's. Mixed-use community will include adult housing. 124 townhomes by Northwind Group in planning stages. This is the over 55 neighborhood of the Colony Preserve - 205 acres - Formerly the Links golf course - Gated with 150 units in 6-unit buildings - Clubhouse, pool, lake with boating and more. Pricing starts low $300's (Phase 2). The adjacent neighborhood, Country Woods, is for all ages and this would accommodate those wanting to live near their parents. See the Review with more photos. Green community includes Energy Star appliances, upgraded insulation, Andersen Windows, and state-of-the-art gas heating system. Just a side note: If you qualify for affordable housing, watch for updates about when that might occur in this community. Go visit and consult with the agents on the property. New Country Pointe Plainview - For 55+ (80%) - Resort-styled gated community of condominiums, villas, suites and townhomes. Condominium models now open. Prices start $600's and up for condominiums. Also town home and villa collections. Retail center is planned to be adjacent. Verify information. By Beechwood Homes. Resort amenities. Primrose Lane and Weeks Rd. Maya Circle and Eastview Blvd. 203 attached units since 1987 - 1 and 2 bedroom/2 bath. Amenities include clubhouse, pool, tennis, activities. From upper $100,000's and low taxes (verify). See the Hidden Harbor Estates Review. Stone Ridge Estates - Dix Hills - Small gated condominium community of 2-bedrooms singles and duplexes. Near Tanger Outlets/The Arches. Ride into Manhattan by way of LIRR Huntington Station. 1 mile south of LIE Exit 51. See local Realtors for resales--may be more coming. Luxury attached condominiums on the Northfork, East End - Builder is award-winning Blue and Gold Homes. Started $400's. 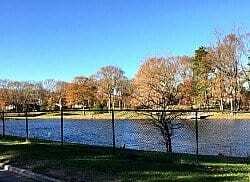 Sunken Pond Estates for Over 55 - Riverhead - Gated by Blue and Gold Homes - Although this community is sold out, there are usually resales available. This is a nice area close to major shopping. Saddle Lakes - at Riverhead just down from Stoneleigh Woods location on Middle Road. Gated older community with resales only. Eagles Walk at East Quogue - by Blue and Gold Homes - If you missed out on this one, you can check the community for resales. For 62 plus. Hamptons location with quiet country ambience. Community has pool and clubhouse. Near beaches, marinas, country clubs, tennis. 346 Homes built in 2 Phases in 1988 and 2000. Amenities include Marina and pool. Locust Cove - Oakdale on South Shore - smaller community of Townhomes and condominiums on the south shore and historic Gold Coast. Electronic gated entry - clubhouse for social activities and potlucks. Sold out - check with local Realtors for resales or by owners - Developed by Calvosa. Fairfield at St. James - Gated condominium retirement community in popular St. James. (Tip: they post some rentals and sales by owner on a bulletin board inside their clubhouse front door. Resales only. Fairfield at St. James at Fairfield and Moriches in St. James, Suffolk County, has over 600 units. Lots of land and space throughout. Amenities include pools and clubhouse. Close to major shopping. Transportation, activities and great location. Price range approximately upper $200's and up. Kensington Gardens - St. James - Suffolk County - In St. James starting in upper $200,000's - 104 co-op condominiums. Pool, clubhouse, Fitness. Some affordable units. Highway 347 to Moriches and about a mile to Lennox - look for sign. Setauket Meadows by Northwind Group in East Setauket - Luxury condominiums on 27 acres. Gated community in 3 Village area. Sold out. Hulse Rd & Enterprise Dr.
Encore Lake Grove By WCI - In Lake Grove adjacent to Whole Foods Market. Luxury condominiums. Now sold out. Contact management for resales. No rentals. One of my favorite communities for location on Long Island. You can walk to Whole Foods and the Lake Grove Mall is across the street also. Very central location. See my review of Encore Lake Grove. Please see On-Site Review and more photos: "Encore Lake Grove Retirement Community"
Encore Atlantic Shores - Also by WCI. Now sold out. Check local Realtors for resales. East end of Long Island where it becomes very flat and all farmlands. Upscale homes and amenities. 59 Encore Blvd., Eastport. (Don't confuse with Meadowbrook Pointe Athletic Club and Spa in Nassau County also by Beechwood). 280 2-bedroom semi-attached homes in Medford. Some with basements and 2nd floor. Gated entry full-time manned. Energy Star. Started $500's. See local Realtors for resales. Sunrise Village - Sayville - Lincoln Ave and Revere Dr - Older community of about 200 2-bedroom condominium homes with pool, clubhouse. Resales only. A viewer says "I like this community because the roads are winding. It is charming and has a certain appeal." Luxury condominiums with lower level having basements. For 62+ by Engel Burman Group. Elegant traditional design with contemporary touches. 112 2-bedroom, 2-bath condos in upper/lower level buildings. Upper level features elevators and lofts and lower level homes have basements. Lots of storage areas. Country Pointe Woods - At Manorville By Beechwood Homes - Townhomes at the gateway to the Hamptons. Resales only. Across from Tallgrass Country Club. on 100+ acres. 1 and 2 bedrooms - approx. $70,000-mid-$200's. Clubhouse, pool, tennis. Not gated. 631-744-6000 - Sheffield Dr. and Whiskey Rd. Amenities include wide streets, single garages, pool and clubhouse. Stony Brook Rd and turn onto Oxhead Rd. The Highlands of Port Jefferson - 118 Windward Dr., Port Jefferson - Contemporary-styled condos near the picturesque downtown for great shopping, restaurants, marina and more. Pool, clubhouse, activities. Electronically gated, low maintenance condominiums of 1 and 2 bedrooms - Clubhouse, pool, Fitness Center, recreation and more. Rear patio/balcony. 2nd floor vaulted ceiling in living room and bedroom. Rare 1-bedroom floorplan. Also, 2-bedrooms/2 baths. Condos started upper $200's. Also 2-story townhomes were from $400's. By Beechwood Homes. Gated, active adult community in Nassau County with many luxury amenities. Condos, townhomes and villas were from $500's and up. Sold Out. Woodbury Cove - In Nassau County - 100 condominiums - On the Gold Coast in Woodbury, LI. By Blue and Gold. Whitewood Landing by Blue and Gold - Massapequa Park - 48 waterfront condominiums . Walking distance to shopping, parks and boating. Check for resales--now sold out. Harbor View - Port Washington (Nassau County) - Upscale Over-55 community next to the New Amsterdam Lifecare community. Another luxury community in the Harborview development which consists of 145-unit highrise condominium building and ranch homes- adjacent golf course - sold out. See your local Realtor. Port Harbor Condominiums - Port Washington (Nassau County) across from harbor - Resales - see local Realtors - also check for rentals if available. The Seasons at East Meadow by The Engel Burman Group - Check out this company for over 55 communities in Nassau County. Horizon at Roslyn - For traditional elegance, this rental community is on the Roslyn Harbor Gold Coast. Fifty apartments set on 11 acres with some views of Harbor. Very upscale and lovely 1,2, and 3 bedrooms. Some niceties like round-the-clock concierge and help with unloading groceries, pool, etc. (verify) Some with harbor views. Atria on Roslyn Harbor - Same area as above but a different community. This one is exclusively for seniors who are looking for a luxury independent living lifestyle with services. 18 miles to Manhattan (verify). If you are looking for a short-term rental, find a community you like, call the community or order their newspaper for classifieds. Most retirement communities on Long Island have short-term rentals available since members travel often in retirement or are snowbirds. Atria Hertlin Place - (formerly Hertlin House) In Lake Ronkonkoma (Suffolk County) - Housekeeping services - Events Calendar of Activities -14-acre site. Sterling Glen - This developer has five rental apartment retirement communities on Long Island for over 55 and now part of the Atria Senior Living Group. Atria Senior Living - See description of communities on Long Island by going to their website. See separate page for comprehensive list of independent and assisted living communities. Peconic Landing - Only equity based lifecare community in New York state. Jefferson's Ferry - South Setauket - Located in beautiful Three Village Area on 50 acres. 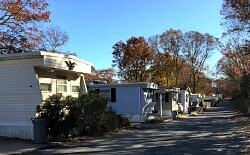 CCRC - Resort-style apartments and cottages. Fine dining, housekeeping, heated indoor pool, jacuzi, fitness and massage therapy. 631-650-2600 for brochure or appointment. Mt. Sinai area: There may be a new lifecare community coming to the Mt. Sinai area in the future where the proposed Harbor Village was going to be. 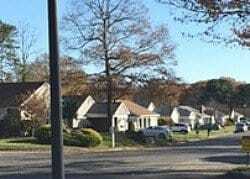 Calverton Meadows - Calverton - by Hometown America - Hamptons area on East End. Near beaches, country produce and wineries. Enjoy a casual lifestyle. Near VA Cemetery. Land-leased new or resale. Some resales under $90,000 listed on their website. Foxwood Village - Gated by Ritz-Craft manufactured homes on leased lots - New and resale - resales from $150,000 - Country area on East end west of Riverhead. RV parking area. Riverwoods - By Kingsley Living - surrounded by state park - Rural setting on Eastern end of Long Island. 376 land-leased lots. Clubhouse, social activities, clubs and recreation. RV parking. Riverhaven - Riverhead - land-leased 103 lots - clubhouse and recreation. 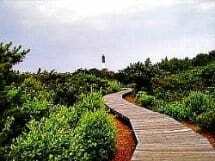 The Lighthouse at Robert Moses State Park is kept as natural as possible. Note: We do not make recommendations or give advice. All listings are for information only. Please verify all information and prices as they can change.